Growing elderberry trees is surprisingly easy. Elderberries and elderflowers make delicious foods and beverages, plus research shows they’re a helpful immune-boosting medicine to fight colds, flus, and inflammation. Here’s a complete guide to growing and harvesting your own elderberries and elderflowers! Elderberry, aka Sambucus, is a small, deciduous tree that grows in virtually every temperate region on earth. There are dozens of different species of Sambucus around the world. Some species feature red berries, some blue, some black/purple. 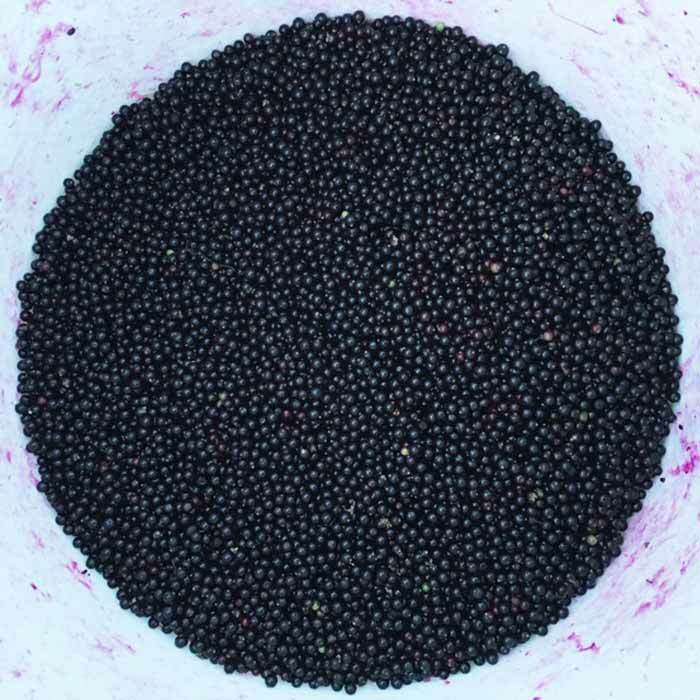 A beautiful 5-gallon bucket full of perfectly ripe elderberries from Tyrant Farms. 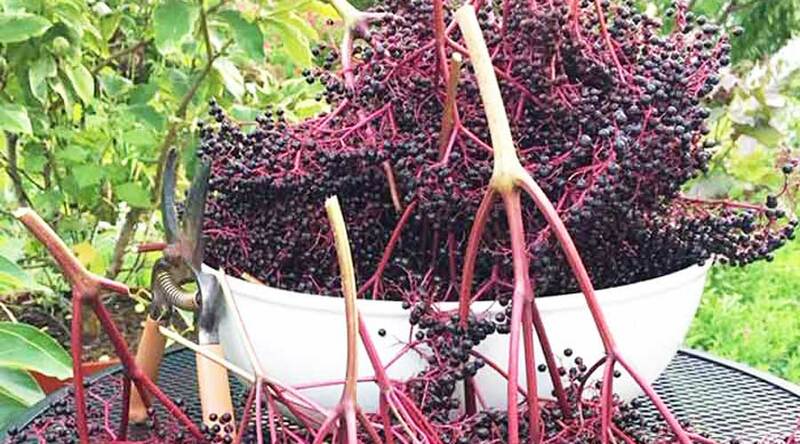 In this article, we’ll be focusing on how to grow one particular species of elderberry: Sambucus nigra, aka “black elder,” which has native subspecies throughout North America, Europe, and western Asia. 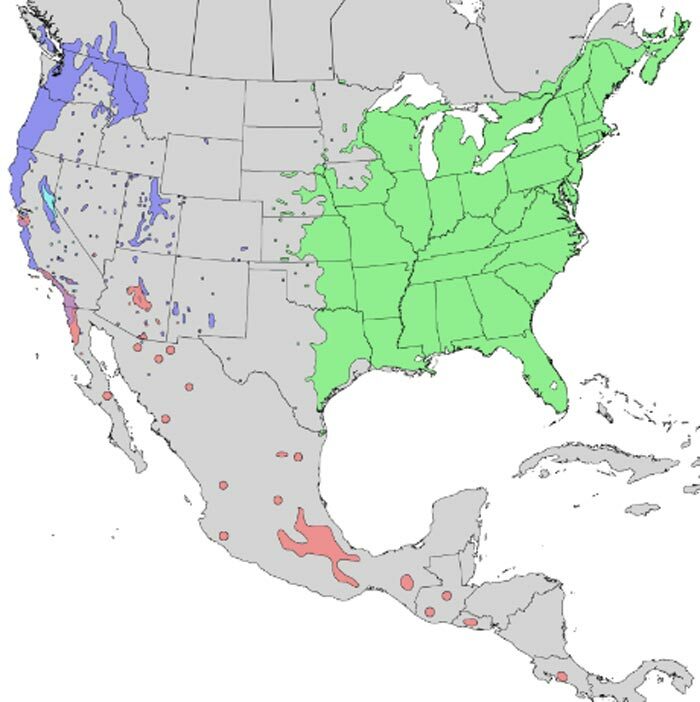 Native ranges of various elderberry species in North America, which grow from Ag Zone 5-8. Sambucus nigra range shown in green. Image courtesy Elbert L. Little, Jr., of the U.S. Department of Agriculture, Forest Service. Sambucus nigra plants feature dark purple-black berries, and are generally considered to produce the best tasting fruit of all the elderberry species. They also have the highest concentrations of health-boosting compounds such as anthocyanin (which gives the berries their purple/black color). We grow Sambucus nigra varieties, and recommend you do as well. For easier reading, we’ll simply refer to Sambucus nigra as “elderberries” for the remainder of this article. Growing elderberry trees in an edible urban landscape works perfectly. The two large plants at the very back of our edible landscape are elderberry trees that are starting to flower. 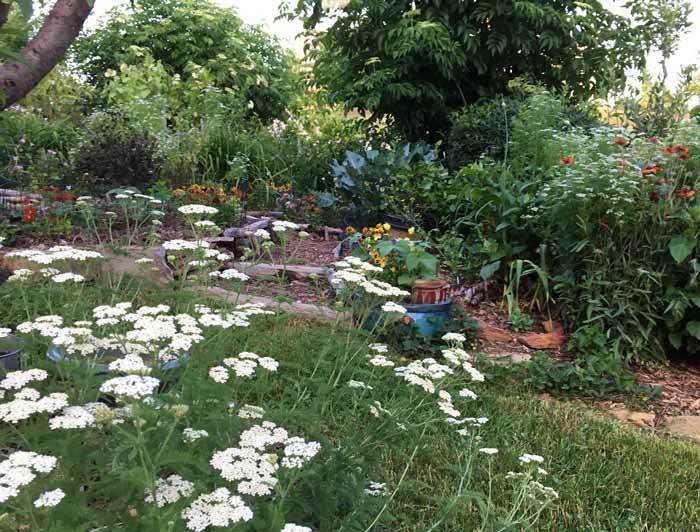 The white flowering plant in front is yarrow, not elderberries. Where does the name elderberry come from? The name “elderberry” comes from the Anglo Saxon word “æld,” which sounds like “old” but actually translates to “fire.” Centuries ago, the hollow, straight stems of elderberry branches were used to blow air into a hot fireplace, fueling the flame. Given that the center of a cut and dried elderberry branch has a light styrofoam-like texture that would make an ideal fire-starting material, our bet is this feature also factored into the plant’s old Anglo Saxon name as well. In our experience, growing elderberry trees is surprisingly easy compared to other fruit trees to grow. We have four mature elderberry trees, and they produce all the flowers and fruit we can handle. Our elderberries have had zero pest or disease problems and once established, and we’ve only had to irrigate them once (during a severe summer drought). 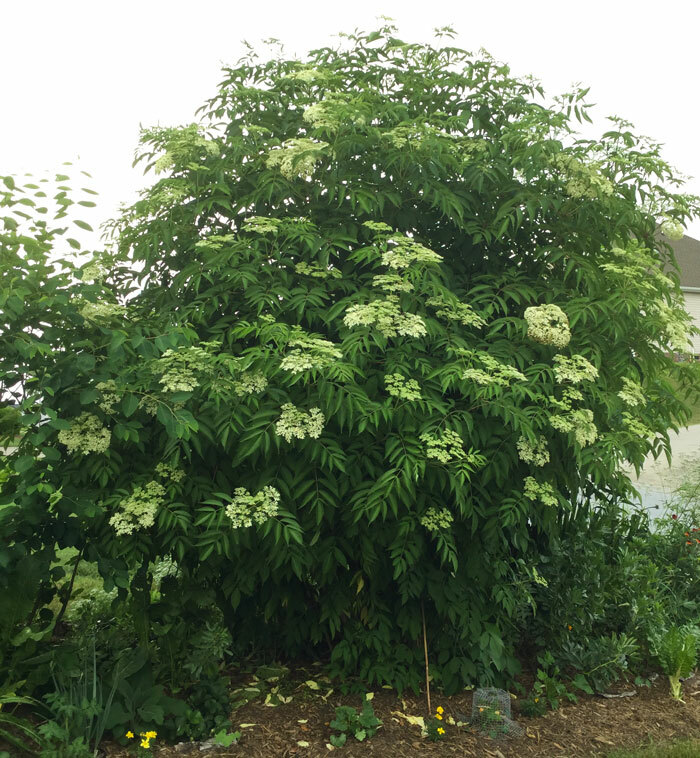 One of the elderberry trees in our front yard (large plant in the back with white flower clusters). 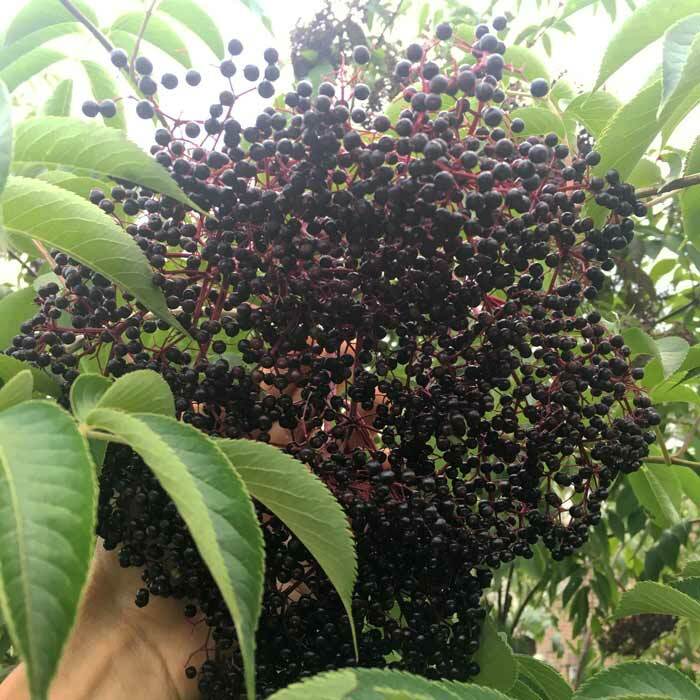 The only negative thing we can say about growing elderberry trees is that they produce more fruit than we have time to harvest during peak fruiting season in early summer. Sound good? 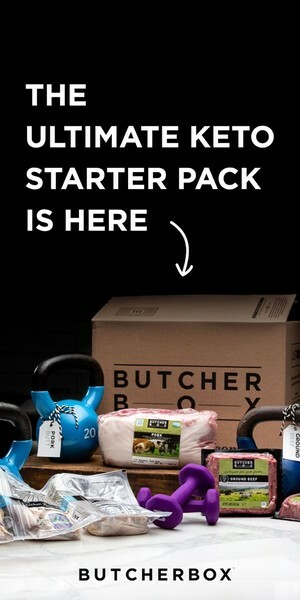 Then plan to grow your own! 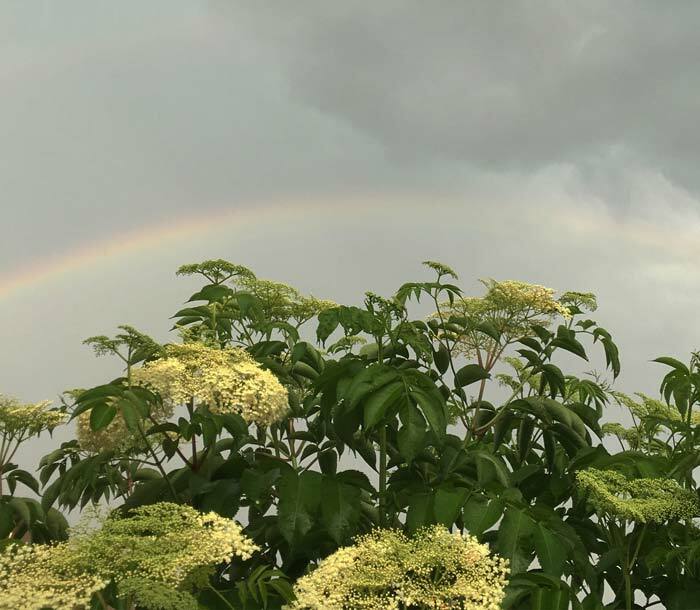 This rainbow formed over the top of blooming elderflowers which is an undeniable sign that you should starting growing elderberry trees this year. 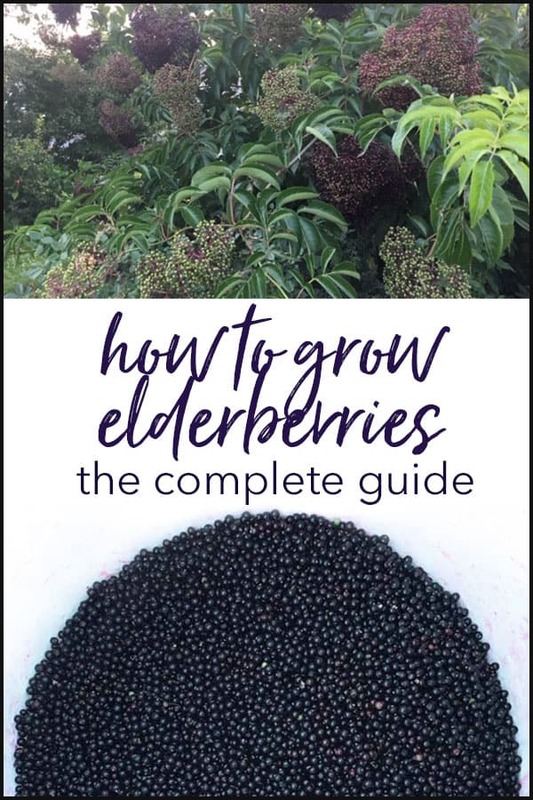 Below is a step-by-step Growing Elderberry Trees Guide that will show you exactly what you need to know to grow huge quantities of elderberries and elderflowers. 1. Are elderberries self-pollinating? 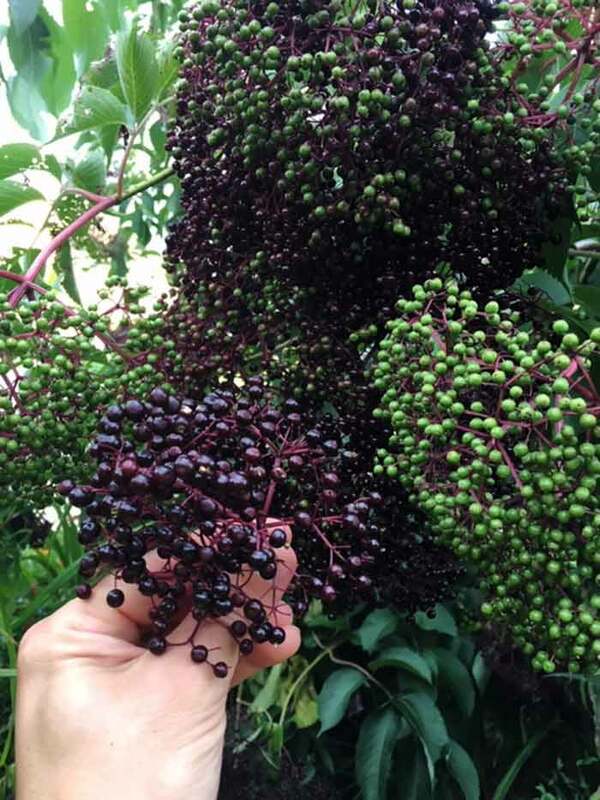 How many elderberry varieties do I need for best fruit production? Technically, elderberries are self-pollinating, but apparently bred varieties don’t perform well without another variety growing nearby. 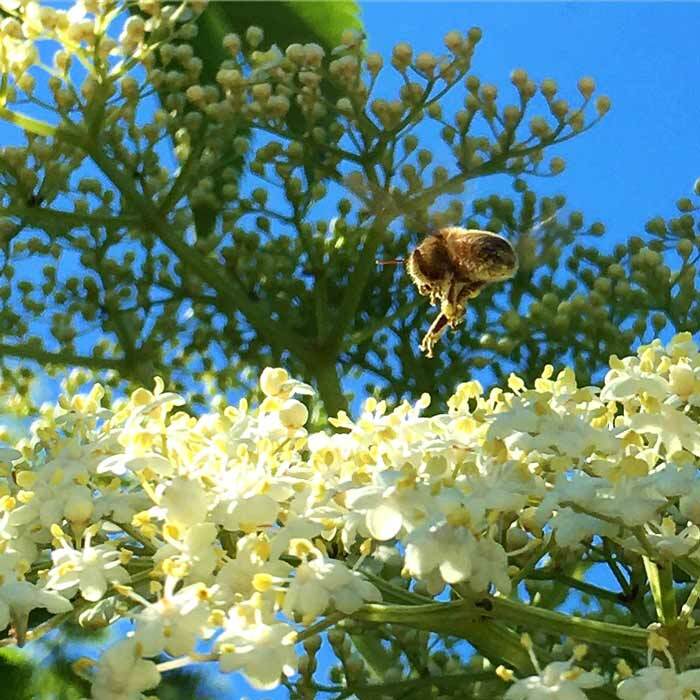 Pollinators (like our neighbor’s European honeybees) LOVE elderflowers. Help your pollinators and yourself by growing multiple varieties of elderberry to enjoy larger yields. Pollination by a different elderberry variety is supposed to significantly increase fruit set and berry size. This means you should grow at least two varieties of elderberries. 2. How close together should I plant my elderberry trees? You should plant your elderberry trees no more than 50′ apart for cross-pollination. If you’d like to plant your elderberry trees more densely, space them no closer than 10′ apart. 3. How big are elderberry trees? Mature elderberry trees can get quite large, about 10-12′ tall x 8′ wide. One of the elderberry trees in our front yard at the very beginning of its bloom cycle. 4. Do elderberry trees need full sun? Can they tolerate part shade? For maximum fruit production, plant your elderberry trees in full-sun spots. Elderberries can also grow in part shade, but you’ll get lower yields. 5. How long do elderberry trees live? 60 years, or about 1/10 the lifespan of Keith Richards. 6. What do elderberry trees look like? Are they attractive? Elderberries have a triangular shape: small base with wide top. The branches are fairly brittle. One problem we’ve encountered growing elderberry trees is that the flower/berry clusters form at the tip of each branch. An elderflower cluster starting to bloom. Each small flower will become a berry. When the branches are loaded with fruit, they tend to hang down under the weight, which makes them prone to snapping during heavy winds and storms. 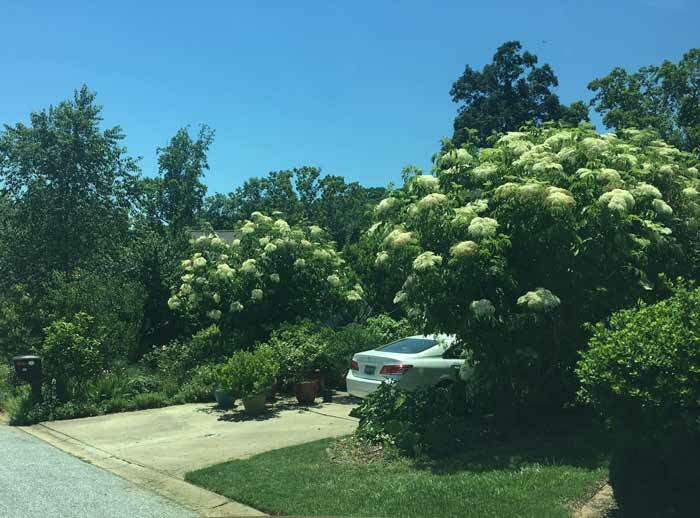 Attractiveness is subjective, but elderberry trees are generally considered to be attractive landscape plants (3 of our trees are located in our front yard). They’re especially beautiful when they flower in June. The ends of every branch are covered in clusters of sweet-smelling white flowers that are buzzing with pollinators. This is the entrance to our driveway when our elderflower trees are in full bloom. 6. What ag zone do elderberries grow in? Sambucus nigra elderberries grow from zones 5-8. Towards the top of this article, you can see a map depicting the natural zones of various species of elderberries native to North American. Based on the information above, make sure you have the space and ideal growing conditions before committing to growing elderberry trees. An individual elderberry is about 1/8 – 1/4″ in diameter. Inside the berry is about 3-5 small seeds. Each year, mockingbirds unintentionally start dozens of elderberry trees from seed in our yard, when they eat the berries and excrete the seeds. (Coincidentally, this is how elderberries spread in the wild.) Unfortunately for us, the mockingbirds don’t tend to aim for spots in our garden where we want elderberry trees growing, so we have to pull the young plants before they get established. You can also start new elderberry plants from seeds you find in the mature berries — although we don’t recommend you use the mockingbird method due to sanitation concerns. Simply plant your elderberry seeds 1/2 – 1/4″ deep in containers in early spring, then transplant them out to their final spots when they’re about 6″ tall. Or take the lazy approach and sow the seeds directly in the desired spot in your garden. Since elderberries readily hybridize, you’re unlikely to get plants that are true to the parent when growing elderberry plants from seed. However, you’re still likely to get good fruit from your new variety. Growing elderberry trees from seed does means it will take you longer to get a harvest (3 years) than it will with the other two methods below (which will each give you fruit in 2 years). If you know someone who has mature elderberry plants, ask them to give you some of the cuttings when they cut their plants back in late winter. Or if you know how to identify wild elderberry plants, you can source your own cuttings. Elderberry cuttings are ridiculously easy to root, as we found out the hard way years back when The Tyrant had me cut back our dormant elderberry “shrubs” from 12′ tall to about 6′. I took the cuttings and tossed them at the back of our property next to a path. When spring came, we noticed that every single elderberry branch that was touching the ground had put down roots and was sending up new growth. Since we didn’t want elderberry trees growing in that spot, all of the now-rooted plants had to be pulled out of the ground. 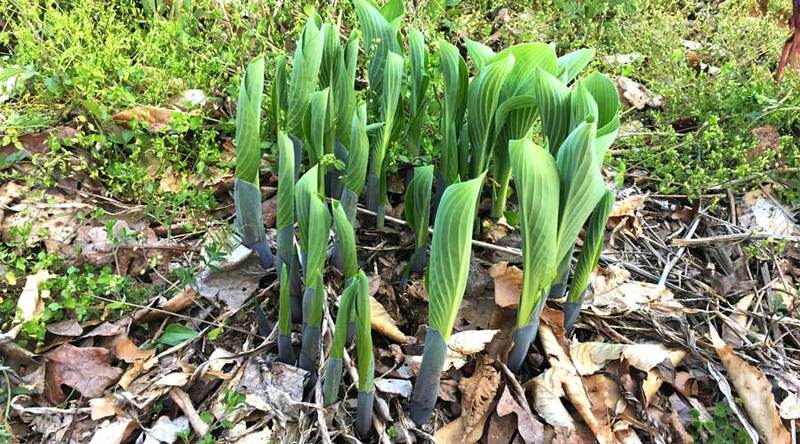 Collect cuttings in the fall, late winter, or early spring. Hot, dry summer conditions can reduce your elderberry transplanting success. Use branches that are 1/2″ – 1″ in diameter. Cut them into 1′ long cuttings. Be sure you’re using living branches, which will have a green streak under the bark. Either: a) stick the cuttings 6″ deep in containers with potting soil, or b) stick them 6″ in the ground in their final location. If you go with option b, be sure to first amend the soil with ~40% compost to native soil. Then top-dress around the plant with 2-3″ of mulch/wood chips (being careful not to put mulch against the stem of the plants). Water in the elderberry cutting. 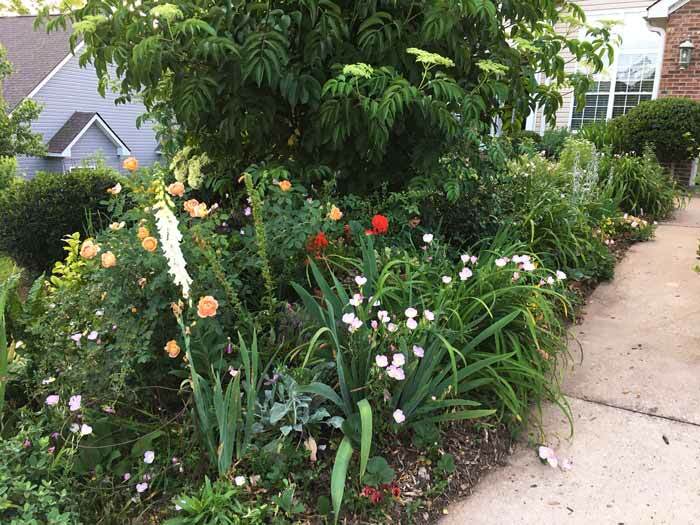 Keep the soil moist (but not wet) until you see new growth on the cutting by ensuring that it gets at least 1″ of water per week via rain or irrigation. You’ll never forget picking your first ripe elderberry cluster. 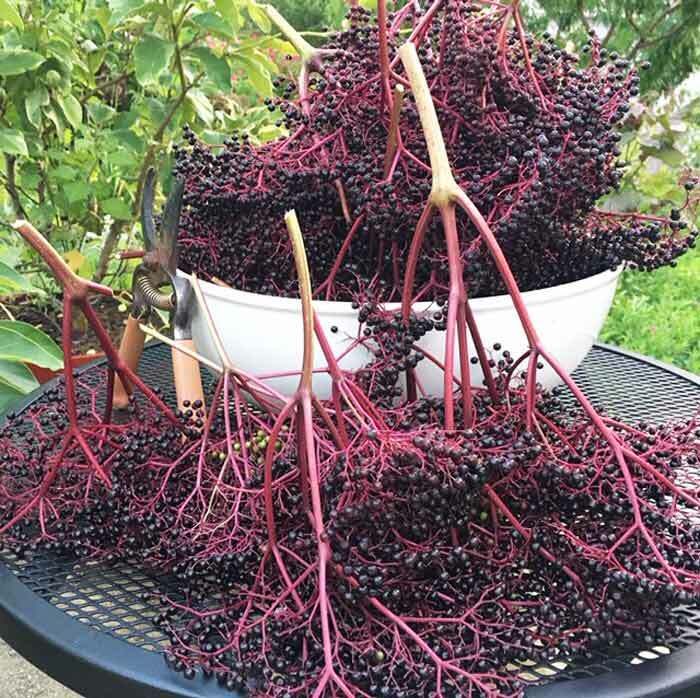 If you order elderberries from an online plant nursery, you’ll get small potted or bare root plants in the fall or spring. These are ready to go in the ground immediately. To plant, simply follow steps 4 and 5 from the elderberry cuttings section above. You can be absolutely certain you’re getting multiple varieties to ensure good fruit production. This is why we originally bought our elderberry trees as bare root plants. Elderberry Varietals: We grow ‘Adams’, ‘Johns’, and ‘Nova’ elderberry varieties. ‘York’ is another popular variety that we have yet to grow. Frankly, we can’t tell much difference between any of our elderberry varieties in either taste, fruit size, or yield. However, all of the bred varieties we grow produce significantly larger berries and larger yields than the wild elderberry plants in our area. 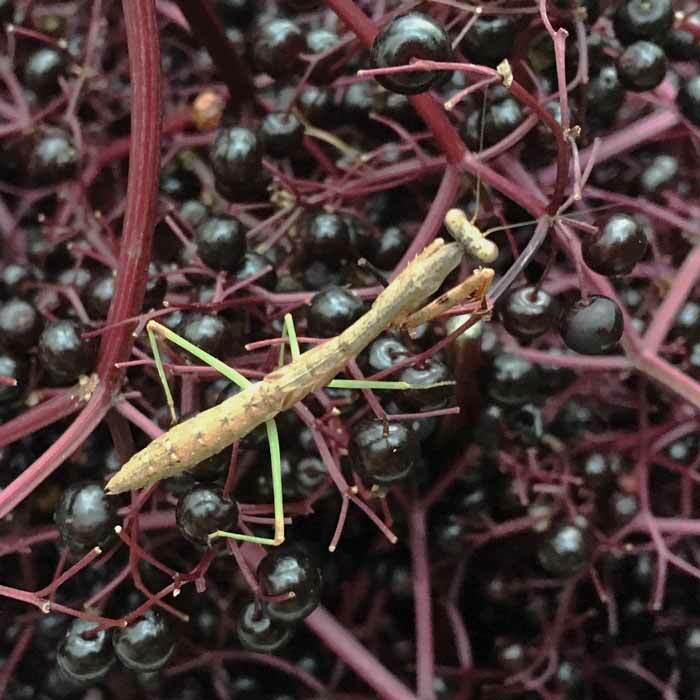 This Carolina mantis says that all varieties of elderberry are its favorite. During the first year that your elderberry trees are in the ground, make sure they get 1″ of water per week via irrigation or rain. 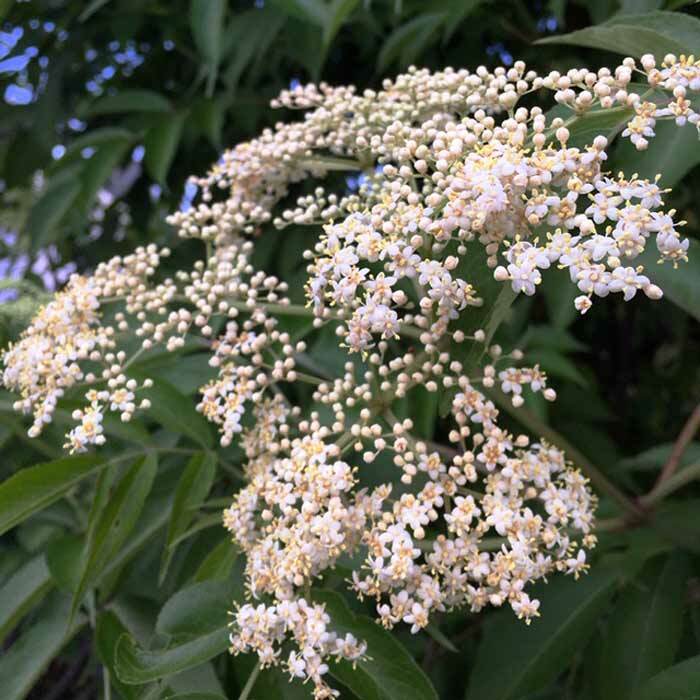 After year 1, your elderberry trees should be well-established and not need any additional irrigation if you live in a temperate climate region where it rains regularly. We’ve irrigated our mature elderberry trees once: during a “150 year drought” three summers ago when we didn’t get rain for 3 months and temps remained in the 90s. In the late winter-early spring before they break dormancy, put a 2-3″ layer of compost around your elderberry trees. Don’t till it in, let nature do the work. 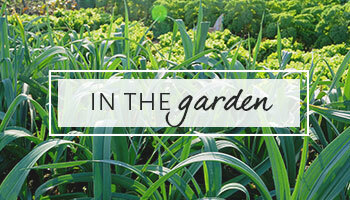 Then top-dress the compost with a 3-6″ layer of wood chips/mulch. Repeat these steps yearly. This practice will give your elderberries all the nutrition they need to remain healthy and productive. If for some reason you notice your elderberry trees looking nutrient-deprived (yellowing leaves, stunted growth), sprinkle a slow-release organic fertilizer around the trees. In late winter before the trees break dormancy, cut the branches back to about 6′ tall. This way, you’ll be able to reach the flowers and fruit with a ladder in the spring and summer. Elderberry suckers: Mature elderberries will send off lots of underground suckers from the parent plant. If not maintained, these can end up turning the area into a dense thicket of elderberry trees. In our experience, removing elderberry suckers is the maintenance chore that requires the most time of all when growing elderberry trees. 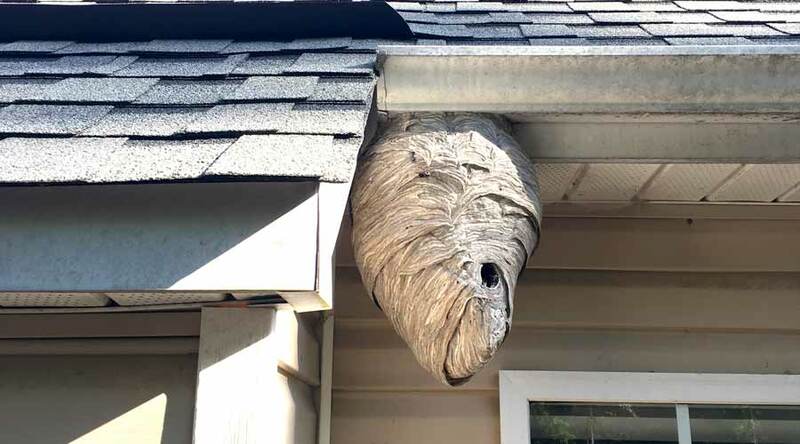 We live in one of the most humid, disease-prone and insect-infested regions in the US. Another nice thing about growing elderberry trees: ours have never had a pest or disease problem despite our location. Elderberry Pests: Japanese beetles do enjoy eating their leaves, but don’t do enough damage to warrant significant intervention. 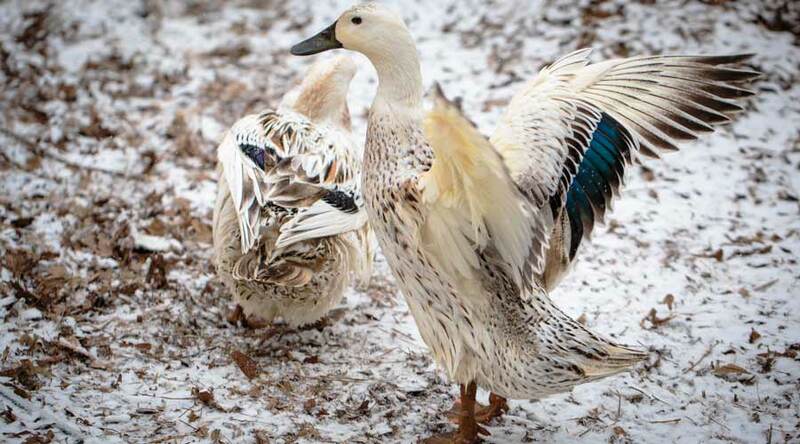 We simply put out Japanese beetle traps, then feed the beetles to our ducks who then turn the beetles into eggs for us (article). Another reason not to use insecticides when growing elderberry trees? They’re covered with pollinator and other beneficial insects, especially when they’re flowering. 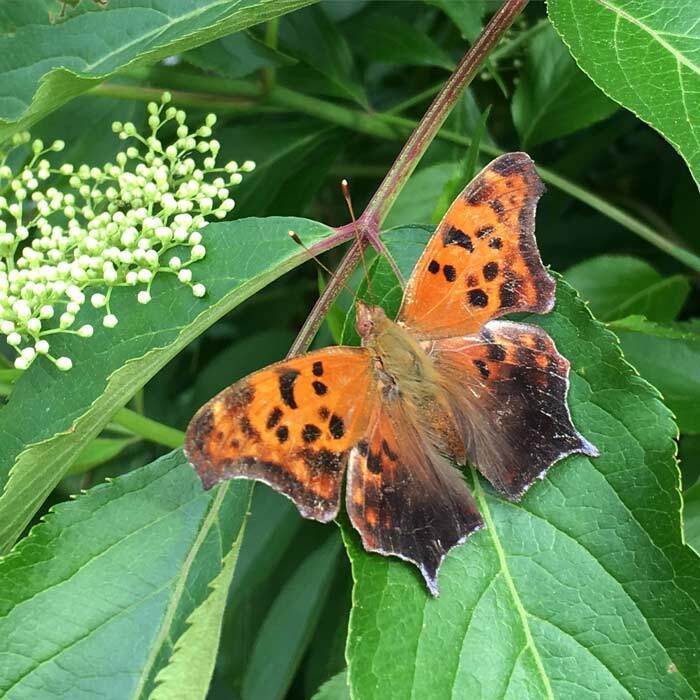 Here’s a beautiful question mark butterfly (Polygonia interrogationis) resting on one of our elderberry trees. As mentioned earlier, birds do like elderberries. We have so much fruit (including dozens of pounds of ripe elderberries each day in the summer), that birds don’t make a noticeable dent in our elderberry production. Since birds are also great insect predators, we’re perfectly happy to share our bounty with them. If birds are putting a sizable dent in your elderberry production, try hanging aluminum pie pans in your elderberry trees. You can also put out an inflatable scarecrow owl – just move it around from time to time so the birds continue to think it’s real. Elderberry diseases: If you encounter a plant disease on your elderberry trees, first make sure you’re using the compost + mulch method recommended previously. Unhealthy plants are much more prone to pests and diseases. Next, consider using probiotic foliar sprays. Store bought Serenade or DIY actively aerated compost tea made from worm castings or compost will both help in disease prevention and reduction. Is it safe to eat elderberries? Are elderberries poisonous? Do keep in mind that the leaves, twigs, branches, seeds, roots, and unripe (green) berries of elderberries contain cyanidin glycosides and alkaloids, which can be toxic to humans and animals. Elderberry clusters ripening on our trees. The only parts of elderberry plants that are safe to eat are the flowers and ripe berries. The ripe berries are perfectly safe as are the flowers. How do you harvest elderflowers (elderberry flowers)? One of the best things about growing elderberry trees is getting elderflowers, an absolute delicacy. 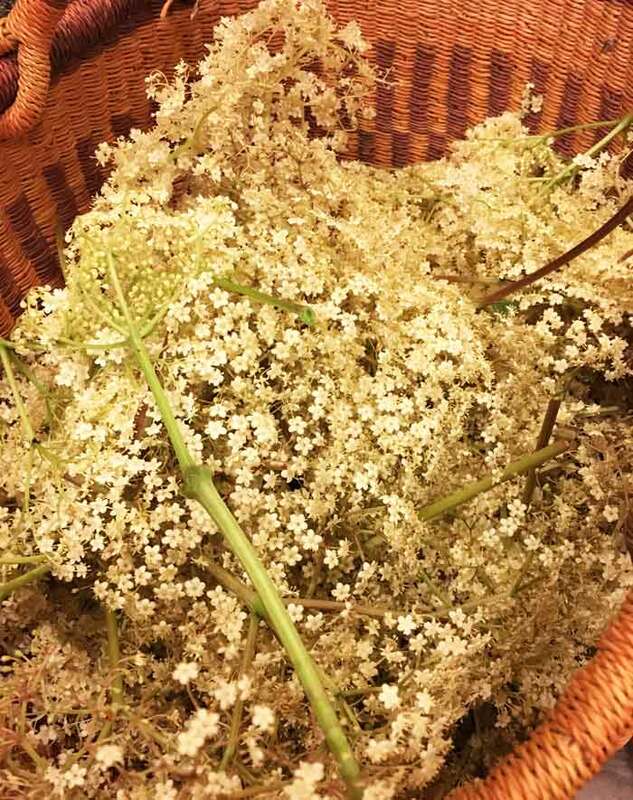 A harvest basket full of elderflower clusters. 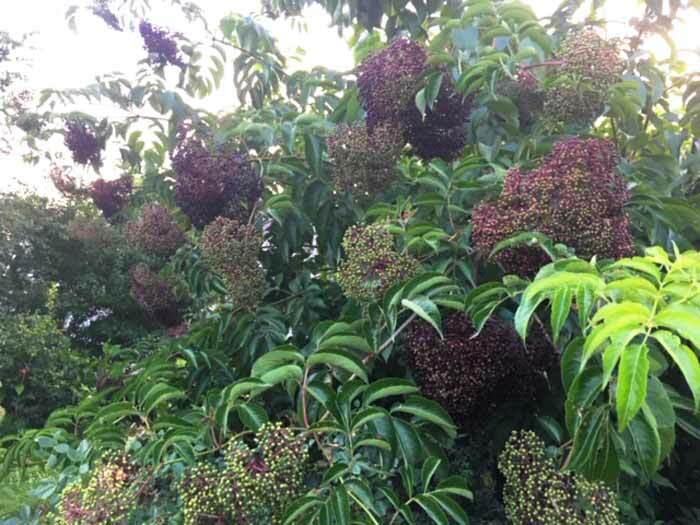 The first year your elderberry trees produce flowers (year 2 or 3 after you start them), you’ll have a decision to make: should you harvest the flowers? The more flowers you harvest, the less berries you’ll get. If you harvest all the elderflowers, the plant will put more energy into future growth, but you’ll get no berries that year. As your elderberry trees mature, you’ll have more flowers and fruit than you can handle. Given how brittle elderberry branches are, we focus our flower-harvesting efforts on the outside branches and the weaker branches. These are the branches most likely to snap in a storm when they’re fully loaded with berries. In our ag zone (7B in Greenville, SC), elderflowers can be harvested in early June. To harvest elderflowers, cut the entire flower stalk at the base. Repeat until you have all the flowers you want. Processing elderflowers takes a good bit of time. 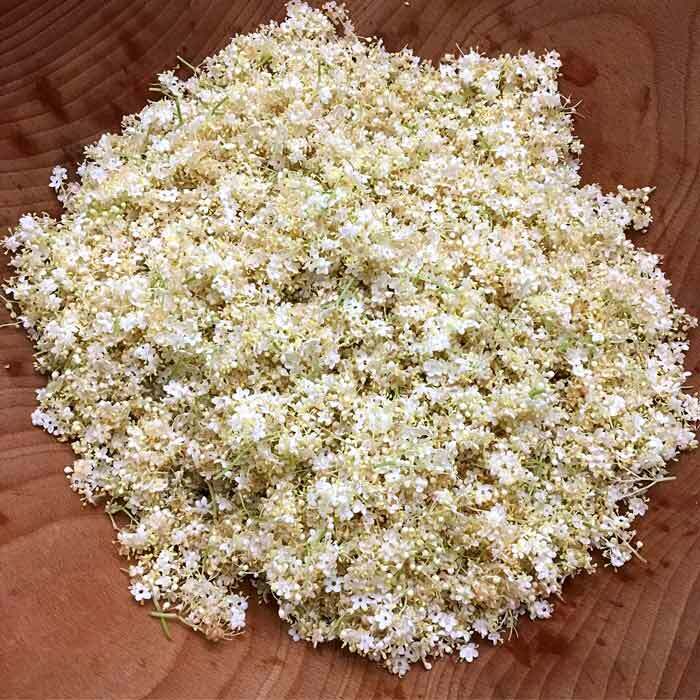 Freshly harvested and processed elderflowers, ready to be dehydrated or used fresh in recipes. The subtle yet indescribably delicious flavor of elderflowers makes the effort of picking them more than worth it. 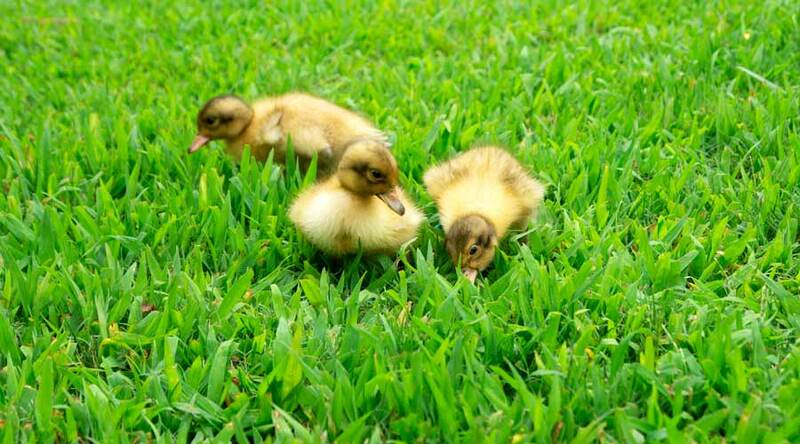 They don’t shake loose from the flower stalk very easily. Instead, they have to be pulled off by hand. The incredible flavor elderflowers impart make the effort well-worth it though. 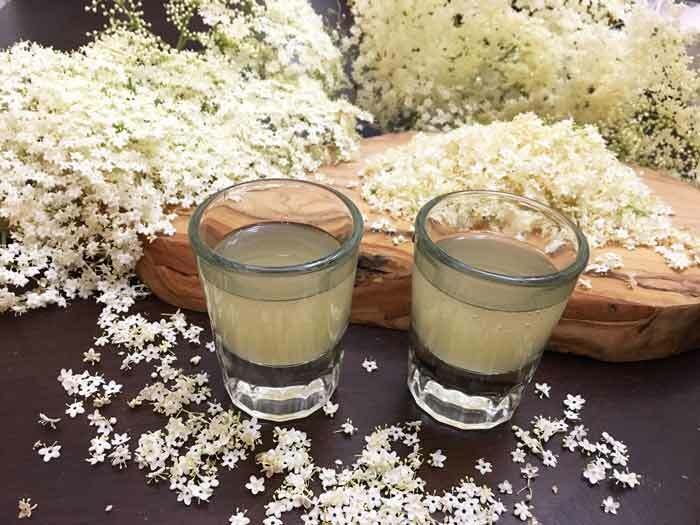 Once you’ve removed the elderflowers from the stalk, you can either dry them for long term storage OR make them immediately into magical concoctions. Our personal favorite is the decadent Sparkling Elderflower Syrup/Cordial. 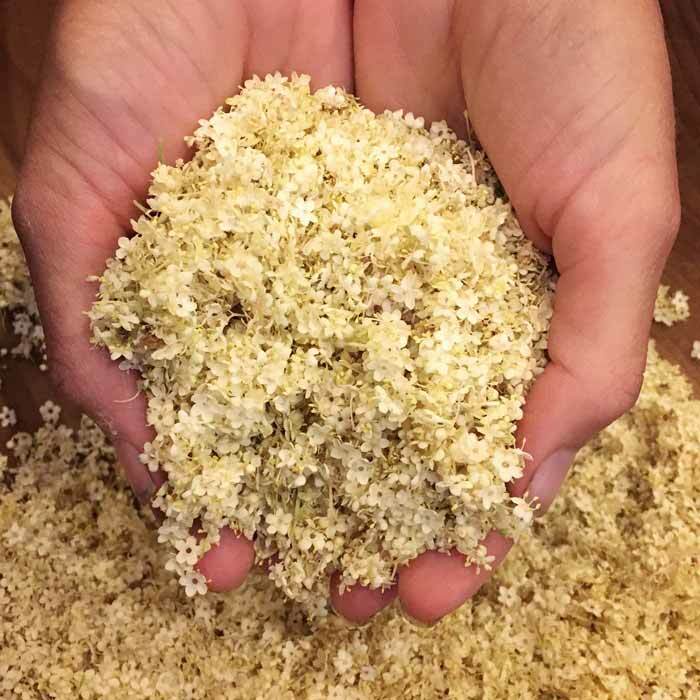 Tyrant Farms’ fermented elderflower cordial is our favorite use of elderflowers. 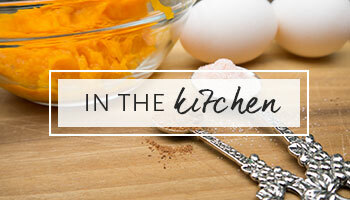 Get our recipe here! 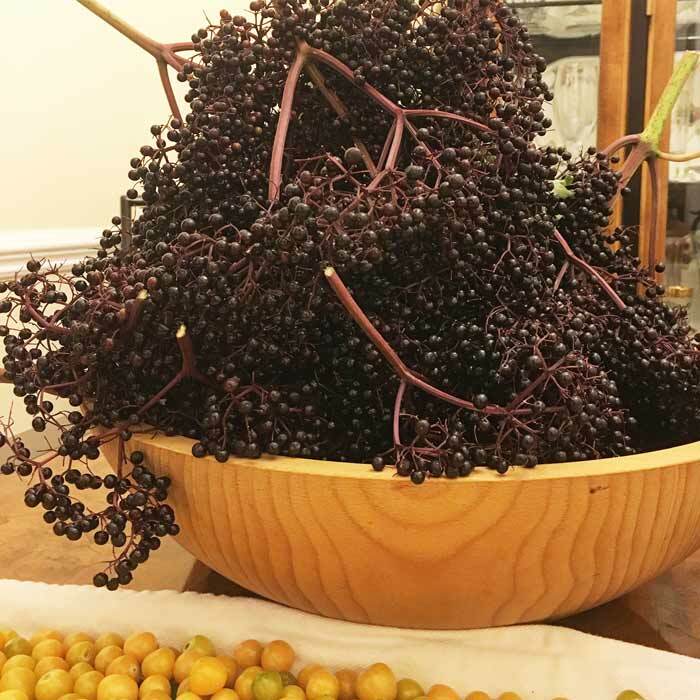 How do you harvest elderberries (fruit)? When are elderberries ripe? How do you pick them? In our ag zone (7B in Greenville, SC), elderberries ripen from mid-late July. Ripe elderberries are so dark purple that they appear black. After cutting off the berry clusters, you’ll need to remove the berries from the stems. Wait until your elderberries are fully ripe before picking them. The berries should be dark purple-black in color. Here are ripening elderberry clusters on the same tree. The first clusters will ripen up to two weeks before the final clusters ripen. On a single large cluster of elderberries there may still be a few unripe berries that you can pull off and discard before processing. Just as with the elderflowers, harvest ripe elderberries by cutting the entire head of elderberries off of the plant. Freshly harvested elderberry clusters at Tyrant Farms, ready to have the berries removed from the stems. How much fruit can a single elderberry tree produce? 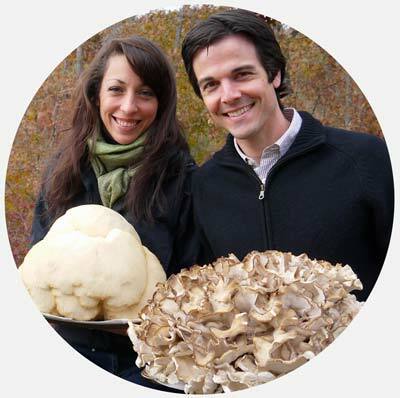 The annual average yield is about 12-15 pounds per plant. 1. 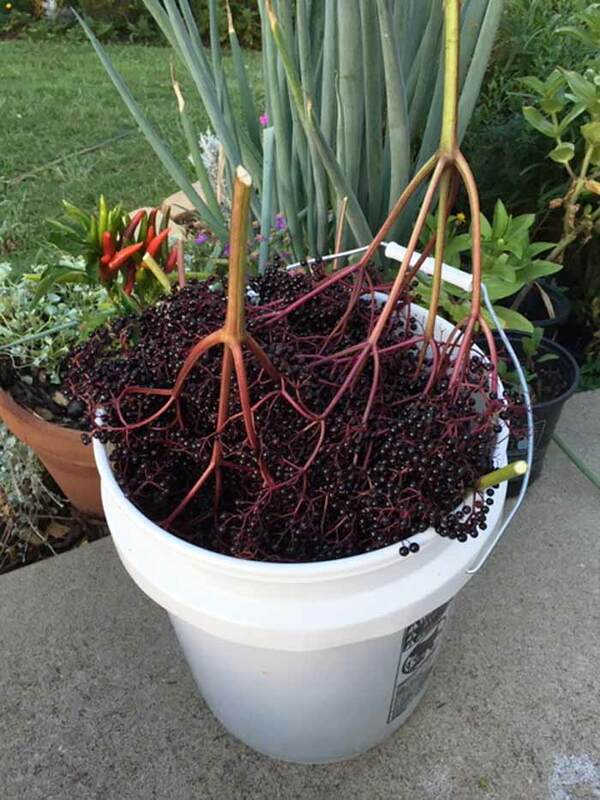 Bucket method – You can take a large 5-gallon food-grade bucket and whack the elderberry cluster back and forth again the inside. This removes most of the berries quickly, but does do more damage to the individual berries. 2. Hand-removal method – Don’t worry, you won’t be required to remove your hands for this method. Start by cutting the larger berry cluster into more manageable chunks. Then hold the base in one hand while you pull the berries off over a bowl. Repeat until done. This method is fairly time-consuming. It takes about 1 hour to process 1.5 lbs of fruit. What do raw elderberries taste like? Frankly, not great. Raw elderberries taste similar to a watery blackberry. However, when you cook elderberries some amazing chemistry takes place that turns their flavor into a rich blackberry/grape jam-red wine flavor that’s quite delicious. 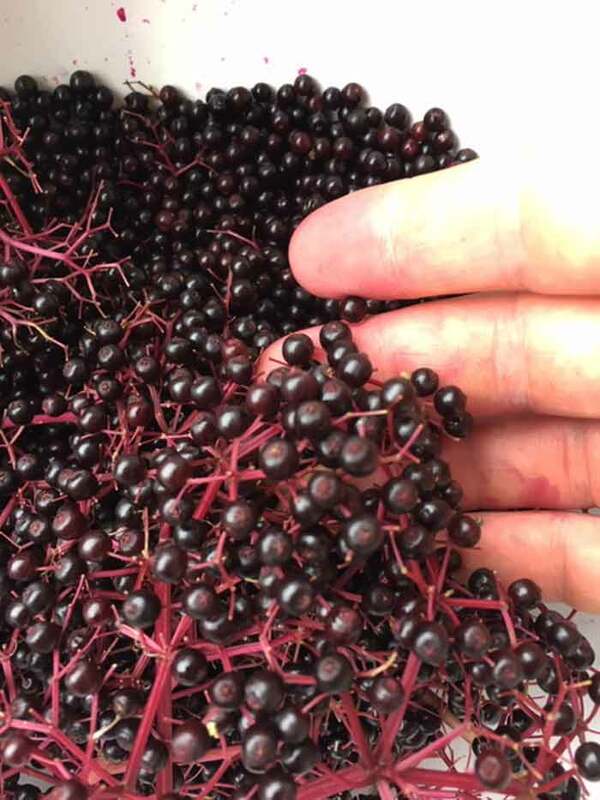 How long will raw elderberries keep? You’ll need to refrigerate or freeze your processed elderberries immediately. They’ll last in the fridge for up to one week before they’ll start to turn. Frozen elderberries will last for years. What can you make with elderberries? Jams, pies, gummies, wine, and pretty much anything else you can dream of making with berries. Our personal favorite is making elderberry syrup (our recipe), which we drink throughout the winter to boost our immune system and avoid getting sick. Tyrant Farms’ elderberry syrup. Dang delicious, and a potent medicine as well. Get our recipe here. Do elderberries have medicinal properties? Yes. Elderberries and elderflowers have been used for centuries for their purported medicinal benefits. Recent studies have started to prove that elderberries do in fact have medicinal benefits that mirror their historical use. Elderberries can reduce the severity and duration of flus, colds, and bronchitis. Elderberry and elderflower extracts have anti-inflammatory, antioxidant, and anti-diabetes effects. Elderberry nutrition: Aside from their medicinal benefits, elderberries are also high in vitamins and minerals. Here’s how elderberries compare to other common fruits on select vitamins and minerals. Elderberries are also one of the highest antioxidant fruits on earth, even ranking higher than blueberries and cranberries. A gorgeous bowl of elderflowers. Tasty medicine. Grow elderberry trees is actually quite easy. Now you know how to do it AND how to harvest elderberries and elderflowers! 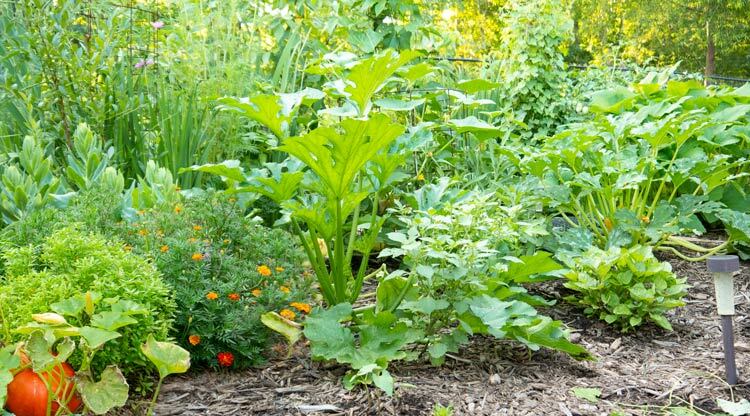 We highly recommend these easy-to-grow medicinal plants to home gardeners and diversified farmers alike.